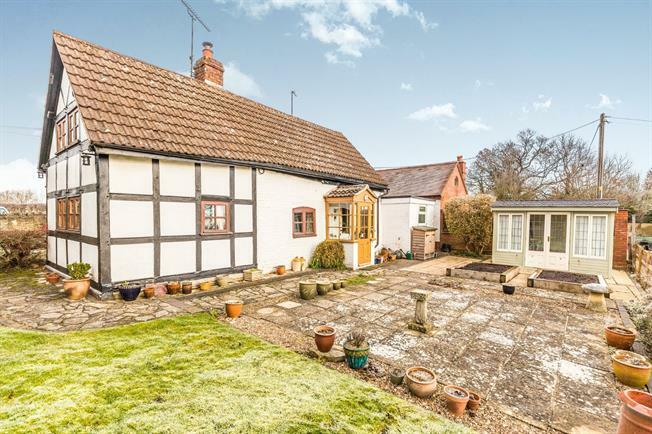 2 Bedroom Detached Cottage For Sale in Worcester for Offers Over £280,000. This property's price has dropped from £350,000 to Offers Over £280,000. A great opportunity to acquire a beautiful two bedroom, 18th century Grade II Listed Cottage within the countryside, a perfect, rural, country location, perfect for commuters. This cottage is located on a plot of 0.25 acres, it provides off road parking for multiple vehicles. The Cottage compromises of two bedrooms, two reception rooms, inglenook in the lounge, kitchen, utility and family bathroom, within the garden, raised flower beds and two beautiful summer houses complete the plot. Double aspect windows facing the front and rear. Storage heater, beam ceiling. Beam ceiling. Roll top work surface, wall and base units, single sink with drainer, freestanding oven. Electric heater, Space for washing machine and Drier. Double bedroom; storage heater, beam ceiling. Double bedroom; double aspect windows facing the front and side. Storage heater, beam ceiling.